What’s it going to be then, eh? Tango for Pianoforte is Burgess’s only tango, written for the pianist Yvar Mikhashoff (1941-93) in 1984 and premiered at the North American New Music Festival in Buffalo, New York the following year. Mikhashoff had asked Burgess to write the piece as a contribution to his ‘International Tango Collection’, a series of 88 tangos by different composers from which Mikhaschoff would play selections during his concerts. The piece is suitably lively and vigorous, and makes characteristic demands of the player to maintain a delicate touch even while at full stretch. 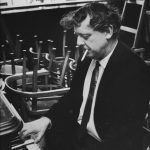 A recording of the piece is available on The Piano Music of Anthony Burgess, performed by Richard Casey. Click the image for the score (opens in a new tab).